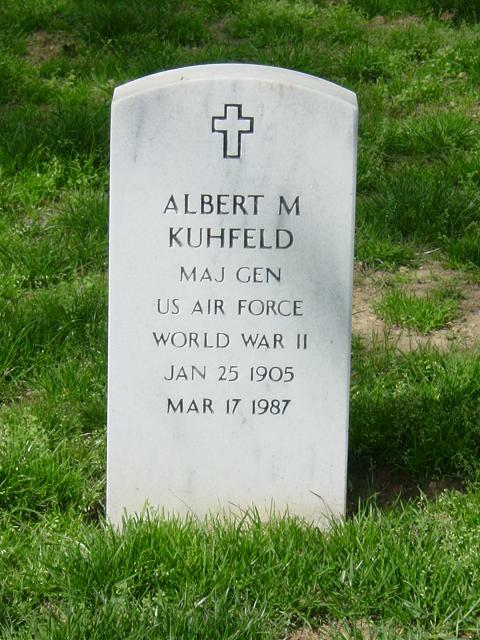 Albert M. Kuhfeld was born at Hillyard, Washington, in 1905. He is a graduate of Central High School, St. Paul, Minnesota, and received his Bachelor of Laws degree from the University of Minnesota in 1926. On December 17, 1926, he was appointed a Second Lieutenant in the Infantry Reserve. He was married to Olive Leone Peterson June 8, 1930. After graduation from law school, General Kuhfeld was a law editor whose abilities were utilized on a reissue of Girard's "New York Real Property Law". During that time he was admitted to the bar of the State of Minnesota, where he began the practice of law. Subsequently, he went to North Dakota and was admitted to the bar of that State in 1927. The following three years he practiced law in North Dakota and did appellate work in the North Dakota Supreme Court. In 1930, he was elected State's Attorney, Golden Valley County, North Dakota, in which office he served for two terms. He became an Assistant Attorney General for the State of North Dakota in 1934 and served in that capacity under three Attorneys General. In 1939, the Legislative Assembly of the State of North Dakota passed a Code Revision Bill providing for the complete revision of the North Dakota Code by a commission consisting of three lawyers from the state, selected by the North Dakota Supreme Court. General Kuhfeld was chosen as Chairman of the Code Commission and given a leave of absence from the Attorney General's office. While engaged in this work he was called to active duty, in March 1942, as a First Lieutenant, Infantry, and was assigned to Camp Crowder, Missouri. In September 1942, he became Judge Advocate at the Salina, Kansas, Cantonment. He entered the Judge Advocate General's School at Ann Arbor, Michigan, in March 1943, and, following completion of the course two months later, was assigned to a short period of temporary duty in the Claims Division of The Judge Advocate General's office in Washington, D.C. In June 1943, he became executive officer to the Air Force Judge Advocate of the Fifth Air Force in the Southwest Pacific area, and a year later was appointed Judge Advocate of the Fifth Air Force in that area. On October 17, 1945, General Kuhfeld was awarded the Bronze Star Medal for meritorious service in connection with military operations against the enemy in the southwest Pacific area. On February 15, 1946, General Kuhfeld was awarded the Legion of Merit for exceptionally meritorious conduct in the performance of outstanding service to the United States while he was a member of the Fifth Air Force. In March 1946, he returned to the United States for assignment to the office of the Air Judge Advocate in Washington, D.C., and subsequently was assigned to the Ninth Air Force at Biggs Field, Texas as Staff Judge Advocate. In August 1946, he received his Regular Commission in The Judge Advocate General's Corps, United States Army. In January 1947, he was assigned to the Office of the Staff Judge Advocate, Headquarters Air Transport Command, Washington, D.C. In August 1947, he requested transfer and was transferred to the Air Corps which became the United States Air Force under the National Security Act of 1947. On July 1, 1948, he was assigned to the Office of The Judge Advocate General, Headquarters United States Air Force. He served first as a Chairman of a Board of Review and, when the Air Force Judicial Council was established as a result of the Elston Act, he became a member of the Judicial Council. In April 1949, he was appointed Brigadier General and Assistant Judge Advocate General for Military Justice. During this time he continued to serve on the Judicial Council until such Council was eliminated by the present Uniform Code of Military Justice. In 1950, General Kuhfeld was admitted to practice before the bar of the United States Supreme Court. General Kuhfeld was appointed The Assistant Judge Advocate General, United States Air Force, February 20, 1953, and was promoted to Major General October 27, 1954. He served in that capacity until he was appointed as The Judge Advocate General of the United States Air Force by the President of the United States effective April 1, 1960. General Kuhfeld is one of the foremost authorities on military justice in the Armed Services. He has distinguished himself repeatedly, for his services in that field. For his contribution toward improving the effectiveness and status of The Judge Advocate General's Department and for his guidance in the implementation of the Status of Forces Agreements which significantly advanced Air Force objectives and national security, for the period February 20, 1953 through March 31, 1960, General Kuhfeld was awarded the oak leaf cluster to the Legion of Merit. As The Judge Advocate General of the Air Force, General Kuhfeld supervised a force of approximately 1,200 lawyers and more than 1,600 nonlawyers who are assigned to more than 300 different legal offices throughout the world. He is also the legal advisor to the Chief of Staff, United States Air Force, and his staff. By federal statute, he exercises general supervision over the administration of military justice within the Air Force. During a normal year, the Air Force will prosecute in the name of the United States more criminal cases (about 36,500 per year) than are filed by the Attorney General in the United States district courts. This tremendous responsibility in the field of criminal law is equaled, if not surpassed, by the many facets of General Kuhfeld's civil law responsibilities - claims, military affairs, patents litigation, international law, and procurement counseling.